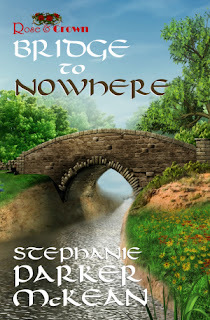 I'm very happy to introduce Stephanie Parker McKean, author of the newly published Christian mystery-suspense romance Bridge to Nowhere to the blog again today for a special interview. I’ve survived being mauled by an African lion and bitten by a deadly water moccasin snake and have emerged victorious after suffering a childhood of sexual abuse. I’ve learned that what doesn’t make you bitter makes you better. You can’t make lemonade without lemons. And thank God, I’ve made the transition from atheist to Christian. My two favourite Bible verses are: in everything give thanks, and all things work together to good to them that love the LORD. Now, Sunpenny Publishing, with its release of my Christian mystery-romance-suspense Bridge to Nowhere, has gifted my lifetime dream of writing books with reality. I’m now married to wonderful Alan McKean—also a published author—and living in the lovely Black Isle of Scotland, even though I was born in Texas and am still proud of my birth state. Next to writing, a few of my favourite things are animals and rocks. I love building with rocks and cement when I’m not writing or taking our rough collie, Angel Joy, for a walk. And about the lion—he wasn’t being mean when he mauled me—he was just being a lion. As for water moccasins, I no longer pick them up to see if they are poisonous or harmless, because they seem to resent being picked up…and after that stay in the hospital—I know anyway! Now for the questions – welcome to the blog! A: I’ve always been proud of having been born in Texas, which is silly—since my parents selected the location and I had nothing to do with it! Actually, I grew up in Georgia, where I graduated from high school and attended college. I say “attended” because I dropped out before I had to take math. I went back to college again in Texas, but by that time I had helped start a local newspaper and was a staff writer. Since all I had ever wanted to do my entire life was write—I dropped out of college again before I had to take math. Q: What’s wrong with math? A: Nothing! Math is wonderful. But it isn’t the perfect science that some claim. Think about it. You put down five crayons on a table and count them, 1-2-3-4-5. Now, go to your job at 8 a.m. and work until noon. Then count the hours for your time sheet and turn them in just the way you counted the crayons: 8-9-10-11-12. That’s five numbers. You’ve worked five hours. But if you count that way, you’re liable to be fired for cheating! Q: What was the inspiration behind Miz Mike in Bridge to Nowhere and the other books in that series? A: One of my favourite authors is Phyllis A. Whitney because her books are well researched and contain elements of mystery and adventure—as well as romance. But her books are not Christ-centered and the characters are young. I built Miz Mike to appeal to an older reading audience that can relate to her love for chocolate, her battle to lose weight, and her ability to live life to the fullest and find romance and adventure just being who she is and not attempting to put on a show to impress others. Q: Describe Bridge to Nowhere in a ten-word sentence. A: A writer sticking to ten words! Bridge to Nowhere demonstrates faith in action rewarded with love. Q: What appeals to you about writing Christian romance-mystery-adventure? A: It’s what I enjoy reading. I got tired of buying mystery and romance novels by popular writers, then chucking them in the trash because of the profanity and cardboard characters who made wrong lifestyle choices with impunity, deliberately mocking God and then—somehow—finding happiness. Q: How long did it take you to write Bridge to Nowhere? A: Writing books is easy. I’ve written two more Miz Mike books in the year since I moved to Scotland, started another, and have written two children’s books. What takes time is editing, marketing, selling. I was working fulltime at a newspaper and had late night meetings when I wrote Bridge to Nowhere, so I think it took about four months. Q: How did living in Texas affect Bridge to Nowhere? A: Without the imaginary Three Prongs, Texas, where misfits fit, there wouldn’t be a Miz Mike series. The characters are Texan to the bone and use cowboy and rodeo phrases that one hears on Main Street Bandera—which some argue is the real Three Prongs. The first time I drove into the beautiful Texas Hill Country, I knew I had found my country. The first time I visited Bandera, I knew I had come home. I wasn’t born there—but I got there as fast as I could! Q: Miz Mike, the main character in Bridge to Nowhere, experiences some comical moments. Can you share your favourite Miz Mike saying from the book? A: That has to be her statement that she always minds her own business. Because, of course, she never minds her own business. Not minding her own business causes Miz Mike to create one 'pickle' after another—as her heartthrob, western cowboy hero Marty calls her escapades. Q: Do you have any other favourite quotes from the book? A: It’s not so much a favourite quote, but I love Clint Flavors. Local folks make disparaging comments about him: “he’s not the brightest crayon in the box,” or, “his elevator stops between floors.” Yet God uses Clint to help Miz Mike solve many mysteries. I’m always on the side of the underdog! Q: What do you hope readers take away with them after finishing Bridge to Nowhere? A: That God is in control. No matter how hopeless a situation seems—like when Mike’s grandson is kidnapped and law enforcement can’t find him—faith is its own reward and God honors faith. A: You mean there are other things to do besides write? Actually, I love being outside. I love walking. I don’t love running—but I do it anyway. What I love most next to writing is rocks. I love rocks. I love to make walls, paths, flowerbeds, bird feeders—anything that I can make from rocks and cement. I can still lift and carry a 80-pound bag of cement. One of my husband’s favourite pictures of me is me standing under the carport holding a bag of cement with the 80-pound label showing. A: Anywhere! Everywhere! I once wrote an entire book standing up at the kitchen counter because I was a caregiver for someone who was terminally ill and couldn't be left alone. It’s another Miz Mike book in the series. I love writing outside, too. Sitting on a nice, warm rock! It reminds me of Jesus—the Rock that holds up the framework of my life—and my writing. Thank you to Stephanie for giving us such fascinating insights into Bridge to Nowhere! To keep up with the latest news on all our Rose & Crown novels, you can subscribe to our Twitter and Facebook profiles. Bridge to Nowhere is available to buy on Amazon UK, Amazon US and The Book Depository. You won my heart with three things: when you said Phylis Whitney is one of your favourite authors, because she is one of mine also and I have every book she ever wrote, (2) when you said you grew up in Georgia, because I grew up and in Georgia, exactly said, Augusta Georgia and went to college at what is now called Augusta State University. And yes, I hated mathmatics also and barely passed in college. (3) your statement about God being in control at all times. I just loved that because I believe that also. I look forward to reading your book and I wish you all the best.